The productivity of solar plants is reduced by soiling of the panel and heliostat surfaces and cleaning is a routine maintenance requirement. The frequency of cleaning is particularly dependent on the local climate with solar panels in dry, arid areas requiring more frequent cleaning. Current cleaning methods are labour intensive and require huge amounts of water. In arid areas where more frequent cleaning is required this can put huge pressure on water resources and have a detrimental environmental and economic impact where water has to be transported in from other areas. Installed global PV capacity expected to reach 545 GWp by 2020 with a total glass surface of over 960,000 acres. CPV and CSP capacity expected to be over 160 GWp by 2020 with a glass and mirror surface of over 200,000 acres. A total glass and mirror surface of over 1.1 million acres will require periodic cleaning. 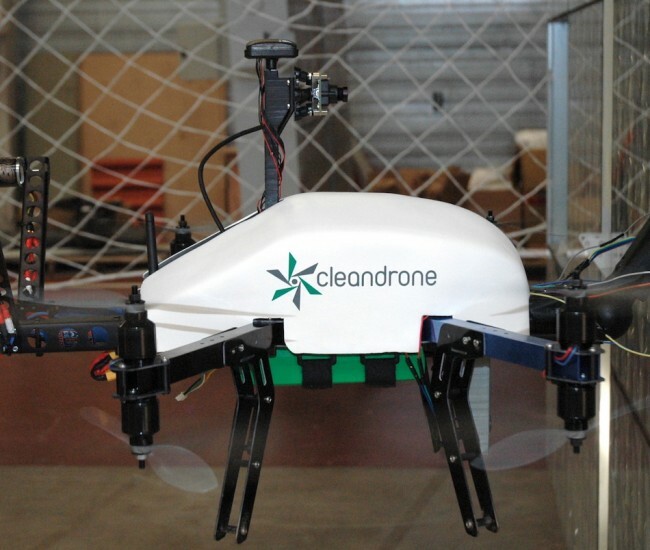 Cleandrone uses advanced proprietary computer vision, sensor fusion and artificial intelligence algorithms to detect and clean surfaces. 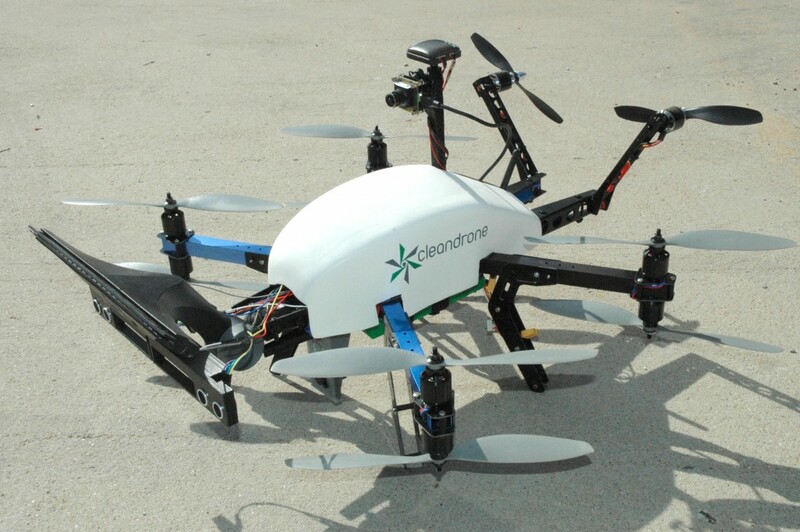 Cleandrone is built around a multicopter capable of controlled vertical and horizontal flight. On board are a glass cleaning device and detachable cleaning fluid container. 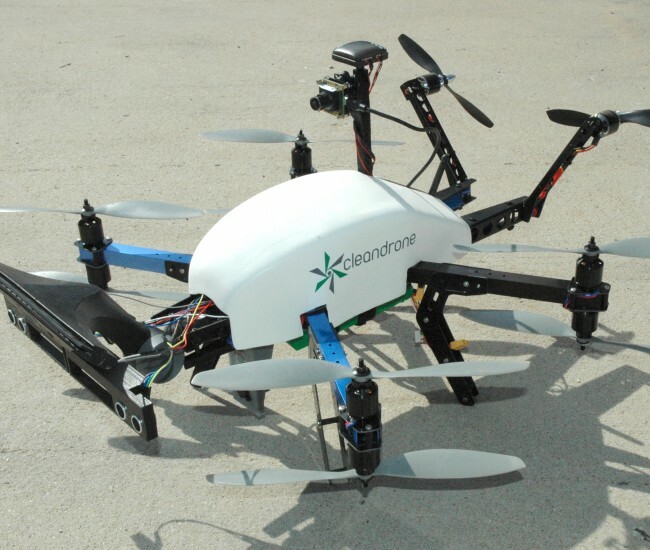 The pusher propellers and pressure sensors allow controlled application of the glass cleaning device against the surface to be cleaned. The cleaning system dispenses, recovers and reuses cleaning fluid during cleaning, ensuring very low water utilisation. 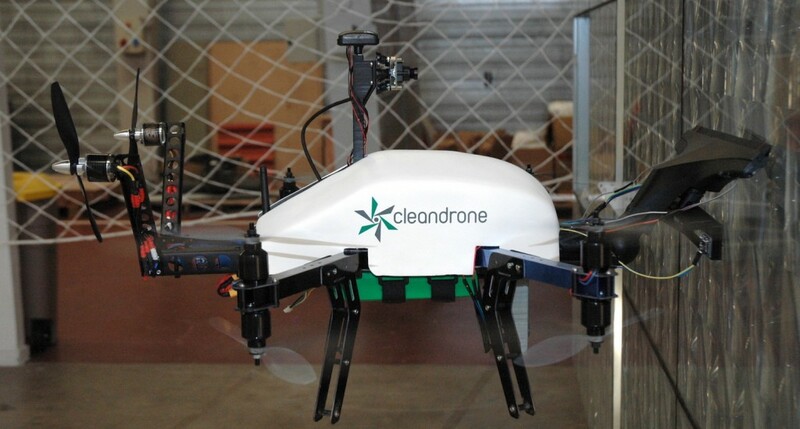 A team of Cleandrones are designed to work autonomously under the coordination of a Ground Control System (GCS) and with automated docking stations that allow the drones to recharge batteries and change cleaning fluid to provide a fully automated cleaning solution.